Joseph Grove and Associates, P.C. Joe Grove spread his hands on the table and then gazed out the window at the gray afternoon before speaking. "The way I see it, life is full of obstacles," Grove said softly. "You can go through them, you can go over them, you can go under them, and you can go around them." "Quit" apparently is not a word in Grove's now considerable vocabulary. A few weeks ago, Joseph F. Grove, 38, of 9504 Minna Drive in Henrico County, was sworn in before the Virginia Supreme Court and thus recognized to practice law in the state. 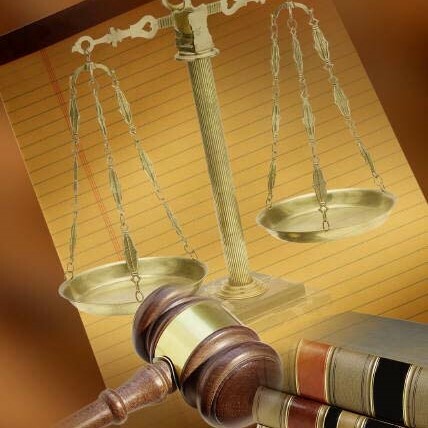 In order to get there, Grove took the unusual action of suing the state Board of Bar Examiners. The suit was settled out of court in February in Grove's favor. That ended another of many obstacles Grove has had to overcome. He never went to High School, and he started college at the age of 27. He has gone from an impoverished background to a future that now holds bright hopes and security. Never was it easy. But Grove, with his massive arms and red hair, looks the role of a fighter. "Something in my nature tells me not to quit. I've gone from being two-fisted physically to being two-fisted mentally." Grove said. Grove can't bring himself to talk about much of his early life. The memories are too painful. He was born in Washington of a family that had deep roots in the Shenandoah Valley for generations. But young Grove, one of 10 children, traveled throughout the country with his family in a never-ending search for work. By the time Grove was 17, he had been in 38 states. He joined the U.S. Navy and says that, after five months of cleaning toilets and barracks, "I realized I had missed the boat." Grove then found that he could obtain the equivalent of a high school diploma in the Navy. He did and began taking the first of many steps over, around, through, and under obstacles that led him to appear before the Supreme Court with his wife Peggy and three daughters watching. Once out of the Navy, Grove began working in the printing trade in the Washington area. He also took a course at a Maryland community college. The course was in world civilization, and, in view of Grove's academic background, the instructor might just as well have been speaking Greek. But he passed and picked up three college credits. "I think that was the proudest moment of my life," Grove recalls. "I also knew then that I could go to college." He ended up in Florida, where most of his family then was living. He finally enrolled in at Broward Junior College in Fort Lauderdale. Another strange world opened up to Grove. But he slowly began getting involved in student activities and the academic life. He remembers always carrying a dictionary, forever looking up the many words he didn't know. "It's a good way to build a vocabulary," Grove said, a warm grin spreading across his face at the though. From Broward, he enrolled at Florida State University and was graduated with a degree in social work. He also picked up 23 hours of graduate work in American government. Originally, Grove wanted to be a dentist. Then the law school idea came. "There's nothing in human endeavor that isn't touched by the law," Grove explained. "Everything in this country is built on it." Grove applied to 43 law schools around the country over a two-year period. He was accepted to at seven, five of them sanctioned by the American Bar Association. He enrolled in the law school at Nova University in Fort Lauderdale. "That first year was an intellectual boot camp," Grove said. But he survived and graduated in 1980. The family survived financially during this time with student loans and with Mrs. Grove working. Graduation only led up to the events that caused Grove to file suit against the the Virginia Board of Bar Examiner. He wanted to be able to practice law in both Virginia and Florida. 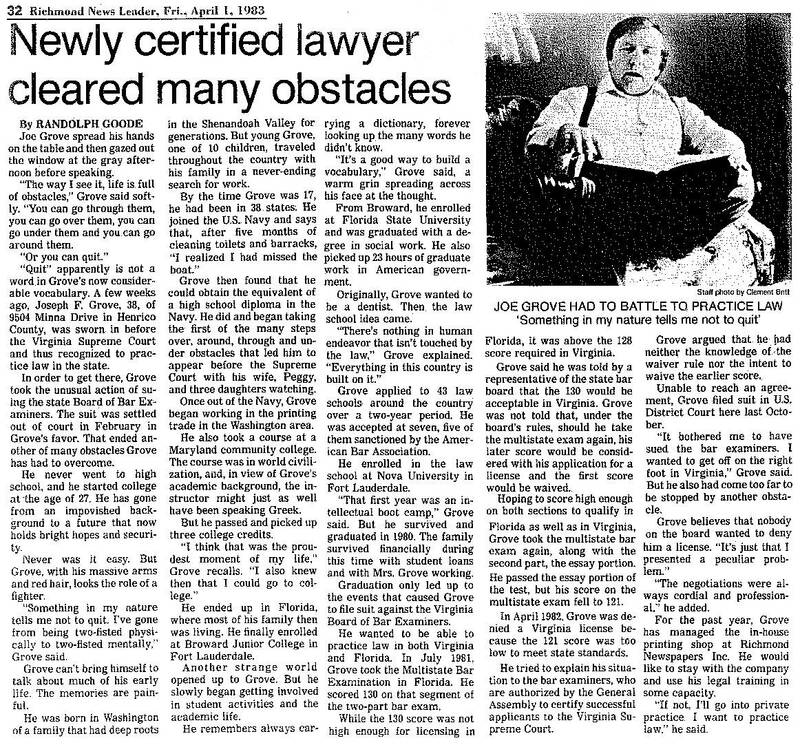 In July 1981, Grove took the Multistate Bar Examination in Florida. He scored 130 on that segment of the two-part bar exam. While the 130 score was not high enough for licensing in Florida, it was above the 128 score required in Virginia. Grove said he was told by a representative of the state bar board that the 130 would be acceptable in Virginia. Grove was told that, under the board's rules, should he take the multistate exam again, his later score would be considered with his application for a license and the first score would be waived. Hoping to score high enough on both sections to qualify in Florida as well as Virginia, Grove took the multistate bar exam again, along with the second part, the essay portion. He passed the essay portion of the test, but his score on the multistate exam fell to 121. In April 1982, Grove was denied a Virginia license because the 121 score was too low to meet state standards. He tried to explain his situation to the bar examiners who are authorized by the General Assembly to certify successful applicants to the Virginia Supreme Court. Grove argued that he had neither the knowledge of the waiver rule nor the intent to waive the earlier score. Unable to reach an agreement, Grove filed suit in U.S. District court here last October. 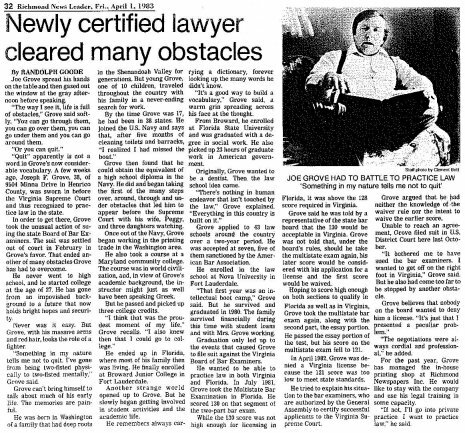 "It bothered me to have sued the bar examiners. I wanted to get off on the right foot in Virginia," Grove said. But he has also come too far to be stopped by another obstacle. Grove believes that nobody on the board wanted to deny him a license. "It's just that I presented a peculiar problem." "The negotiations were always cordial and professional," he added. For the past year, Grove has managed the in-house printing shop at Richmond Newspapers Inc. He would like to stay with the company and use his legal training in some capacity. "If not, I'll go into private practice. I want to practice law." he said.